Votes for Catholic Women - why are women left out of voting at the Synod on Youth? 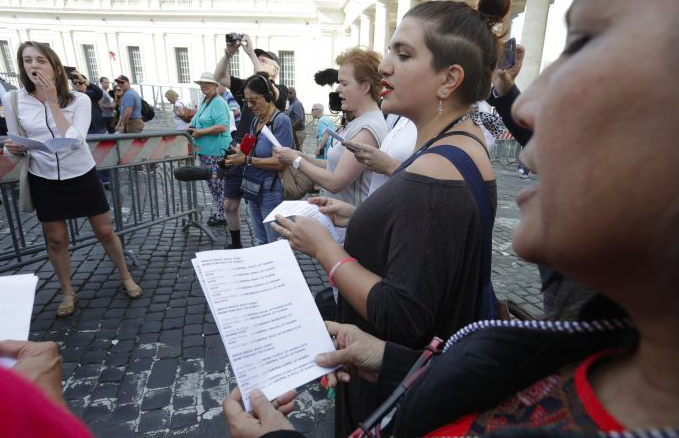 On October 3rd 2018, I found myself standing at the gates of the Vatican together with women from four different continents, calling over and over again “Knock, knock! Who´s there? More than half of the world!” I have never done anything of this sort before, yet, it felt like the best place to be on that day. Passing by were cardinals, bishops and a few lay participants of the Synod on Youth. Only about 10% of these passers-by would be women. None of them will be allowed to vote at the synod. In this context, it was a huge blow to find out in mid-September, when the names of participants were released for the upcoming Synod, that once again, only men will be allowed to vote. Right up to the last days before the Synod, many Vatican observers were still hopeful that a woman would be appointed as a voting member. They had concrete reasons for this hope, being that, aside from the traditionally voting cardinals, bishops and priests, the Pope had accepted two lay men, non-ordained religious brothers, as voting representatives of men’s religious congregations. This set a precedent. Ordination to priesthood was no longer a requirement for voting. Then surely at least some religious sisters would get the right to vote – just like the religious brothers? I was stunned when I read this. My organisation, Voices of Faith, works for the equality of women in the decision-making of the Church and here was a concrete opportunity with no doctrinal questions standing in the way and we were told that we should be glad to be able to speak? Many other faithful women who care about the Catholic Church felt like me. A protest campaign started developing. The Women’s Ordination Conference started a facebook action with a simple sign that read “Votes for Catholic Women.” Voices of Faith joined and soon there were several organizations and many individual women and men in different countries joining together using the hashtag #votesforcatholicwomen. And on October 3rd, a group of us stood on St. Peter’s square in Rome. I was in good company. There were women from Poland, South Africa, India, the USA and many other countries; there were those who are passionate about extending the roles of laity and those who struggle for women’s ordination; there were theologians, writers, women active in social ministries; women in their 20s and 30s as well as others in their 60s and 70s. What many of us had in common was that we have never done anything of this sort before. No, we had enough silence. There is silence about the second-class status of women, silence about sexual abuse in the Church, silence about exclusion of people who do not fit the narrow horizon of the official Church teaching on who counts as a family. We cannot be silent – not because we have come to hate the Church but because we continue to love it. The Church can only spread the good news of the Christian faith when it lives what it preaches – equality, inclusiveness, dignity. As a convert who grew up atheist, I care passionately about this Church and want it to thrive and fulfill its prophetic mission. Votes for Catholic Women at the Synod will not solve all the urgent problems of the Church. But it would be an important sign in troubled times that real changes are following the promising words of Pope Francis about the need for more women in the decision-making processes of the Church. If we are to renew the Catholic Church, women are central, not optional. Our silence can no longer be taken for granted.